This week was a mini-break from allthethings. Sports seasons are in practice mode, a new school quarter has settled in, and the screaming in of the New Year has vanished. Everything seems calmer and in the groove. Last night I whipped out my phone and snapped some pictures of my son as he emptied the trash. “For the internet,” I warned him. I was having yet another moment of Mama-ness that reminded me he will be leaving this home in nanoseconds, and I was enjoying the agreeable-kid-doing-chores vibe he had going on. He mock-posed for me, and my daughter got into the scene. 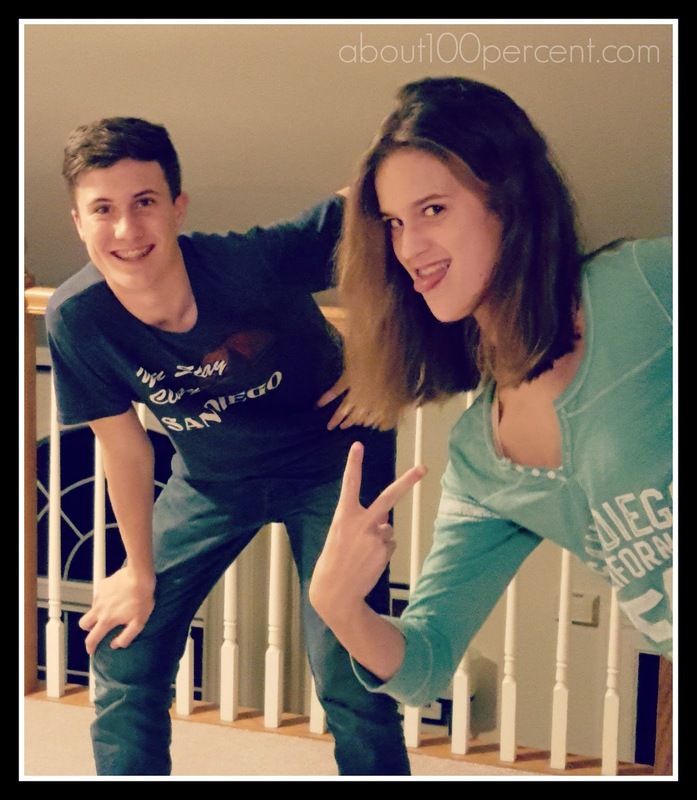 What I captured in the terrible yellowed lighting was the essence of my kids doing what they do best – be kids. I write about them too much. My life is so small right now, just as theirs is about to explode. I am grabbing moments that I should have when they were babies, when women in the grocery store would tell me to enjoy them at this age, and I nodded numbly, because at the end of most days all I wanted was a glass of wine, the TV, and for nobody to touch me or talk to me or breathe. Despite the OMG I just love my kids fixation currently holding me captive, I still wonder what my life would look like without them, if I had cultivated a set of different goals in my formative years and used my intellect and ambition to veer away from this life into another one. What would it look like? What kind of career would I have? Would I be married to someone else, or would I have still met my husband? Would I have different children or none at all? Would I even live here? Alternative storylines are endless, and the irony that I still take the time to daydream about my deeply rooted life as a blank slate is not lost on me. Do other people take time to wonder? Conscience kicks me back into the present and scolds: This is what you’re doing. This is life; this is now. Those other things are just that – other. Your life is charmed. Other people don’t have what you have. This life is good, and the people that surround me within it are, too. I love what we have built together. If I didn’t take time to think about the other I might not appreciate this so much. If-then scenarios are fun to think about, but they serve no purpose, except maybe to give perspective and to stretch the imagination. I don’t have everything. Never have. Never will. I guess being okay with that is a sign of wisdom. Maybe just age. Perhaps complacency. Would I have been this complacent in another life? And there I go again. I do have two goobers who break my heart and make me laugh, and a husband whom I love so much that I find him utterly annoying at least once a day. Those three things stop the wondering in its tracks. I can soo relate to this! I wonder sometimes too, what my life would be like if I took a different path. And it's not longing or dissatisfaction... Just curiosity I guess. I'm trying to be more mindful of moments. Cute picture! I'm crying and laughing which is a sure sign I love this and I love you. YES. To all of this. I swear you have just captured my own heart in your words. I LOVE THIS. You and me, girl. You and me both.